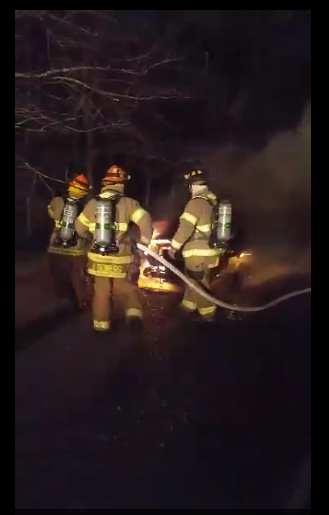 On Monday, January 4, 2016, at 6:05pm, the Galax Fire Department was dispatched to Route 89 (Skyline Hwy) near the Blue Ridge Parkway for a vehicle fire. Upon arrival, 302 reported a fully involved SUV. 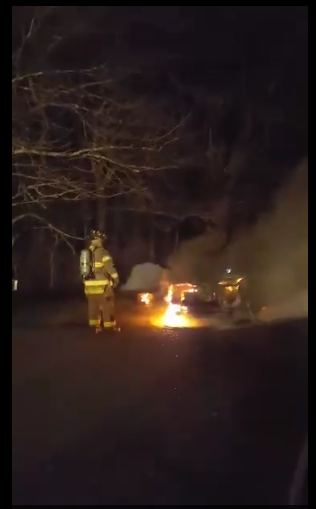 The occupant was traveling towards Galax when he noticed smoke coming from under the dashboard. He pulled off the side of the road, and went to a nearby residence to report the fire. Upon Engine 1’s arrival, attack crews pulled the bumper line and made a quick knock down. The Virginia State Police assisted at the scene with traffic control. Due to weather conditions, VDOT was requested at the scene to treat the road, as water from suppression efforts had created slippery conditions. Crews remained on scene approximately 45 minutes.